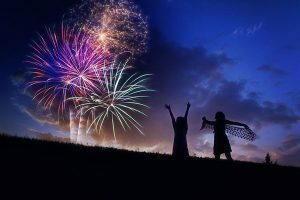 In 2016, at least four people died and about 11,100 were injured badly enough to require medical treatment after fireworks-related incidents, according to the U.S. Consumer Product Safety Commission. And while the majority of these incidents were due to amateurs attempting to use professional-grade, homemade or other illegal fireworks or explosives, thousands were from less powerful devices like small firecrackers and sparklers. The National Safety Council advises everyone to stay away from all consumer fireworks and to only enjoy fireworks at a public display conducted by professionals. Following are some fireworks that are legal for consumers to purchase and use in some states. But just because they are legal doesn’t mean they’re safe. Check out this video by the NFPA. Every year, young children can be found along parade routes and at festivals with sparklers in hand, but they are a lot more dangerous than most people think. Parents don’t realize they burn at about 2,000 degrees – hot enough to melt some metals. Sparklers can quickly ignite clothing, and many children have received severe burns from dropping sparklers on their feet. Physicians at Vanderbilt Eye Institute at Vanderbilt University Medical Center have seen so many eye injuries caused by bottle rockets they conducted a study they hope will lead to better education and “legislative enhancements” on fireworks safety. “The majority of the children (in the study) ended up with reduced vision, and probably half of those were deemed legally blind,” said Dr. Franco Recchia, associate professor of ophthalmology and visual sciences at Vanderbilt. The U.S. Bureau of Alcohol, Tobacco, Firearms and Explosives outlines the risks of these explosive devices.